Smart smoke detectors like the Nest Protect have been available for a couple years now. They’re powerful (if expensive) tools for protecting your family and your home. But at the same time, they’re permanent and oft hardwired fixtures. Apartment dwellers need a smart detector of their own. 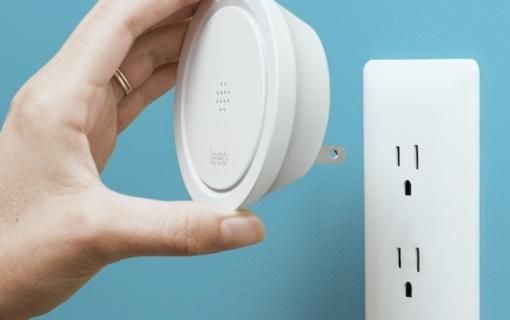 That’s exactly what the just-released Smart Alert Nightlight from Leeo is … sort of. It’s a nightlight and smart home protection system all-in-one that plugs into a standard wall outlet to keep tabs on your “dumb” detectors from up to 75 feet away. When it hears an alarm event or detects a sharp increase in temperature, the Smart Alert will send an alert to your Apple iOS device. You then use the included Leeo app to actually listen in to the alarm. If it sounds serious, you’ll be given the option to dial emergency services. If for some reason you don’t respond to the alert, the app can alert other pre-selected contacts to call 911. The LED-based nightlight can be customized through the Leeo app, so you can quickly and easily adjust it to the perfect brightness for those late night trips to the bathroom. You can also choose from up to 16 million color options for the light to match your décor. The Smart Alert will keep constant tabs on humidity and temperature, and can send alerts if they pass a certain threshold. The Smart Alert Nightlight connects to your home network via Wi-Fi, so be aware that you’ll only be notified of emergencies so long as your home outlets retain power. With a steep retail price of $99, you might well be forgiven for skipping on this technology. But if you’re the type to obsess over the safety of your home or apartment while you’re away, the Smart Alert Nightlight could provide just enough piece of mind to be worth a look. The Leeo Smart Alert Nightlight is currently available for purchase through leeo.com for $99. The Leeo app is a free download for iOS via the Apple App Store. Android support is “coming soon.” You can learn more about the device by watching the short video below.